::: Off the Radar :::: Birthday Week-end Kicks off Tonight @ The Viceroy (8-12) then The Vagabond!! Birthday Week-end Kicks off Tonight @ The Viceroy (8-12) then The Vagabond!! If you're in Miami come celebrate the 'passing of time' with us Tonight!! It all get's started at The Viceroy with it's impressive 50th Floor poolside view from (8-12) then The Vagabond for their amazing weekly soiree!! The Viceroy is a gorgeous New Hotel/Residency located on 485 Brickell Ave with an amazing Club/Pool Deck on the 50th Floor! If you were there for the preview we had a couple weeks ago you know how gorgeous this place is and how amazing the view is! Breathtaking view of Miami's Skyline with a wonderful breeze that keeps us cool poolside and underneath the stars! Get your week-end started with us from 8PM till Midnight as we sip on delicious cocktails and listen to Music Courtesy of offtheradarmusic.com! This week-end also happens to be Paula Beltran's (http://www.littleramonas.com/) and Ray Milian (Off the Radar) Birthday, so we will begin our celebrations here!! Would love to see our friends!! 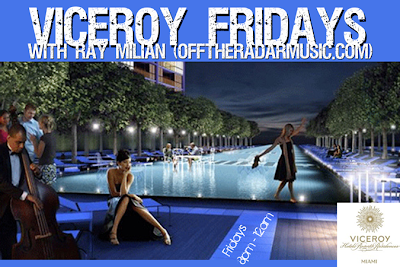 Afterwards the party moves to The Vagabond (30 NE 14 St, Downtown MIA) for their amazing weekly FRIDAY party were Ray is a Resident and the debauchery continues till the wee hours of the night... Last week was out of hand! So much FUN!! Can't wait!! See you Tonight! No Cover, just take the elevator to the 50th Floor! Here's a few tracks for the festivities and to get your week-end started right!! !